I'm really excited to share an awesome news with you guys. It has always been my childhood dream to open my own Ice Cream shop since I was a kid. But since my family has always been in the beauty OEM and services business, I was told to focus on the family business first and not to venture into the unknown world - Food & Beverage industry. Finally, after many years of experience learning and running the family business. I've acquired confidence, knowledge and an incredible net work of friends, I've decided to ventured out on my own to do my dream business! Yet, there are so many ice cream business in Singapore! How can I be different? So, I constantly watched "Shark Tank" the USA angel investors TV show, I've honestly learnt a ton from that show. Please do watch it, if you're an entrepreneur, you would love it! It's showing on NETFLIX now. Anyways, I've shared my dream with a few friends, most of them are so excited! I've partnered up with 2 amazing investors and we have been working on this business since OCT 2017. We really geared up and decided to open before Christmas this year. Hence, we rushed to find a really good location at Level 1 of OrchardGateway, facing the main road. Talk about a good frontage. It is really really important for any new business, to be easy to find and to be able to have a good location whereby traffic is high. We are really excited, as we will be the first in Singapore to specialize in Artisan LOW FAT Desserts. We do not sell ice cream, we sell Gelato and Sorbet. So, most of you would ask, what's the difference? Its just a name? Noooo..... Normal ice cream you buy from a store or supermarket uses Full Cream Milk. Whereby, gelato uses only LOW FAT or skimmed milk. Hence, normal ice cream usually has 25% FATS, while gelato only have below 8% FATS. Then what about sorbet? Good news to all those "Lactose Intolerant" individuals! The answer to eating ice cream without milk or dairy product, is SORBET! It doesn't use any milk or cream or dairy at all. Hence, you are able to enjoy this dessert with no worries of running to the toilet or having tummy ache, or feeling pukish! Oh, did you know that sorbet has less than 2% FATS!? Amazing right? Have you heard of GELATO SHAKE? Or SORBET SHAKE? Time for you to visit us! Enjoy "MILK SHAKE" but at really healthy low fat content. Not only, will we be using healthy low fat ingredients, we are also using top quality pretty toppings from Candylicious Singapore, to beautify our desserts! Why Artisan, you say? Well, our desserts, gelato shake, sorbet shake, are all made into a Instagram Picture Perfect Item. Not only, would it be healthy, delicious, using only the most premium ingredients, we would probably be the dessert shop with the most dreamy, whimsical, artistic kind of desserts. 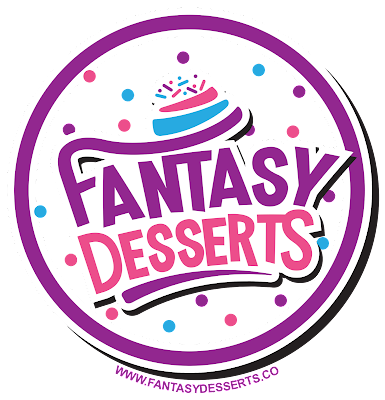 You definitely need to take a look at our desserts photos on our wesbite - www.FantasyDesserts.co to know what I mean. But, because we are the first in Singapore to specialize in such a unique and pretty dessert, we have decided to only upload our product pictures when our shop opens! It's a secret! We are opening for business on 1 December 2017 at OrchardGateway #01-15, 277 Orchard Road. It is going to be a MUST GO / MUST TRY dessert shop. As all new businesses, we need a few days to brush up on our operations and to ensure that all our products and machines will work perfectly well on our grand opening. We look forward to invite all of you to join us on Saturday! Come with your friends, family, kids, colleagues. We are having a 3 Days grand opening promotion! If you would like to enjoy this special prices, just DOWNLOAD this poster into your phone, flash this poster at our cashier to enjoy these special opening discounts. I have always believed giving back to the society and community in all my businesses. Hence, we have decided to open with a good start, to surprised underprivileged kids from BEYOND Social Services. We have organized 30 Exotic Cars and 10 Sports cars from SCCS - Sports Car Club Singapore to pick up 30 underprivileged kids to FANTASY DESSERTS for an early CHRISTMAS TREAT! Our kids would be on display for photo taking at Orchard Gateway Drive through as well as the car park. Candylicious Singapore is sponsoring 100 goodies bag to under privileged kids from Beyond Social Services. We have 30 super exotic sports cars that will drive 25 kids from Beyond to Fantasy Dessert to have a surprise Christmas treat from us. Snow City will be sponsoring some complimentary tickets. Fantasy Desserts will be giving out complimentary hot melted chocolate donuts balls, soft serve frozen yogurt, awesome 1 for 1 deals, and selected items at only $1. 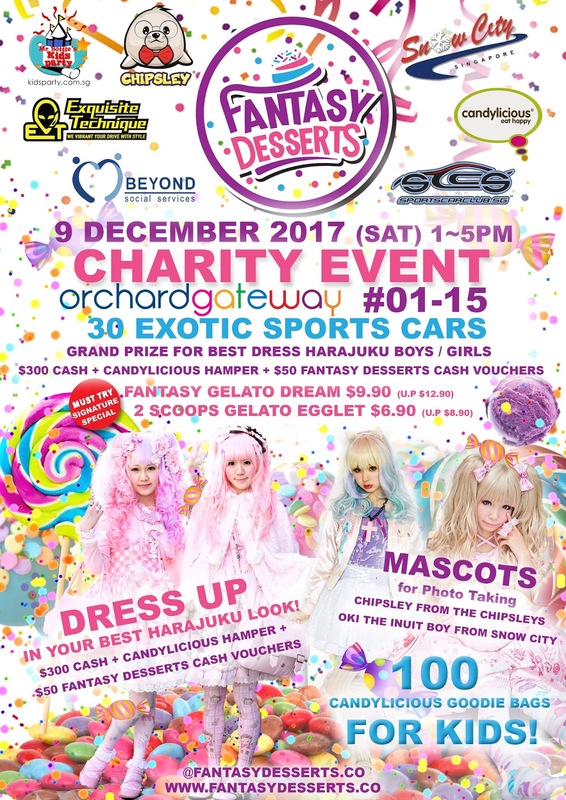 We also have a best dressed Harajuku boy/girl competition, who will win a grand prize of $300 cash + a Candylicious hamper and $50 cash voucher from Fantasy Desserts. These are a sneak preview of what desserts we have at our outlet. Stay tune to our Facebook and Instagram pages to see our "NEW FLAVOUR OF THE MONTH"!